ProQuotes: Wedding is a package of 30 customizable quotes created exclusively for use within Final Cut Pro X. Create elegant scenes for wedding productions with the click of a mouse. Pick and choose from presets with beautiful swirls and gradual animations. This is the perfect title package for enhancing video invitations, displaying romantic texts, and sharing moments of that special day. ProQuotes: Wedding consists of 30 self-animating quotes that can easily be customized with the click of a mouse. Select graceful presets that feature growing swirl elements to quickly add a touch of style to wedding footage. Orient the preset and its elements using on-screen controls, creating brand new styles with controls found in the inspector menu, and create awesome contrast with modular background & frame tools. To use ProQuotes, start by choosing a preset and placing it above media in the Final Cut Pro X timeline. ProQuotes: Wedding features on-screen controls that allows video editors to easily manipulate the position, scale, and rotation of ProQuotes presets. 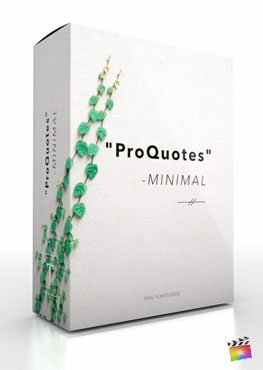 Creating a professional scene with quotations has never been so easy. Although these titles are best used on wedding videos, these thematically styled presets are the perfect complement for any elegant video production. Easily change the colors, fonts, and layouts of title elements to create an entirely new look. Utilize the modular background and frame overlay presets to give the scene additional stylization elements. The modular background tool allows users to create better contrast between the title and the background below. With the blur amount slider, editors can instantly draw greater focus to the text. With tint controls, users can give the scene added color and stronger contrast. Lastly, pick and choose from 5 uniquely styled frames with animation options using a simple drop-down menu. I installed ProQuotes: Wedding and see a red screen similar to this. Where do I find ProQuotes: Wedding? Once the installation is complete, you can find ProQuotes: Wedding in the FCPX Titles library. Where is the tutorial for ProQuotes: Wedding?